Over the weekend, Saudi Arabia detained dozens of high-profile figures, including 11 princes and dozens of former ministers, in a new anti-corruption probe headed by the kingdom’s powerful Crown Prince Mohammed bin Salman. Saudi officials say the detainments are about getting rid of corruption, while some analysts argue it represents the latest step in Mohammed bin Salman’s efforts to consolidate power. While most media attention has been focused on billionaire investor Prince Alwaleed bin Talal, the detention of Prince Mutaib bin Abdullah may have more profound internal political implications. Over the weekend, Saudi Arabia detained dozens of high-profile figures, including 11 princes and dozens of former ministers, in a new anti-corruption probe headed by the kingdom’s powerful Crown Prince Mohammed bin Salman (MBS). Saudi officials say the detainments are about getting rid of corruption, while some analysts argue it represents the latest step in Mohammed bin Salman’s efforts to consolidate power in order to continue his plans to overhaul the country’s economy. 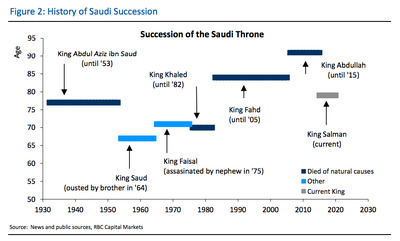 “Crown Prince Mohammed bin Salman’s Saturday night purge represents a stunning political development in Saudi Arabia and a shot across the bow at the old establishment,” Helima Croft, global head of commodity strategy at RBC Capital Markets, said in a note to clients. Among the notable figures detained is billionaire investor Prince Alwaleed bin Talal, who has sizeable stakes in Twitter, Apple, and Citigroup. He also has investments in the Four Seasons Hotel George V in Paris, the Savoy in London, the Plaza in New York, and has invested in the AccorHotels chair and London’s Canary Wharf, according to the New York Times. His arrest likely rattled companies that count the company he founded, Kingdom Holding, as a major investor or shareholder, the New York Times said. Shares of the company, which trade on the Saudi stock exchange, fell about 7.6% on Sunday. But despite the large amount of media attention being focused on Prince Alwaleed bin Talal, Croft argues that the detention of Prince Mutaib bin Abdullah, who was the chief and then minister of the Saudi Arabian National Guard (SANG) since 2010 (a post that was also held by his father, the late king Abdullah), could have more profound internal political implications. SANG serves as a praetorian guard for the royal family and would be sent to clear the streets in the event of a major internal uprising, Croft said. 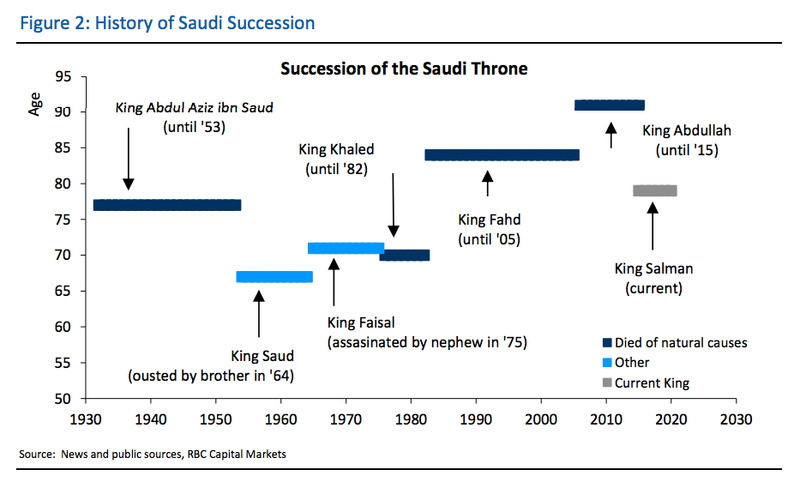 It has been in the middle of politics before, including in 1964 when the Guard sided with Faisal against King Saud and helped to usher the monarch out of power and ensure an orderly transition. “While MBS’ supporters insist that Saturday’s move had absolutely nothing to do with staving off a coup and maintain that it was entirely about eradicating corruption, detaining Mutaib does also seemingly serve a broader power consolidation agenda,” Croft said. “The fact that private airstrips were closed on Saturday also does suggest that more high-level arrests may be looming. Taking it a step further, Jason Tuvey, Middle East Economist at Capital Economics added that it remains to be seen how the Guard, which has been under the influence of Price Mutaib’s branch of the family for decades, will respond to the development. However, if the Guard “falls into line,” he said, then MBS will effectively control the security services in the kingdom, as he is already the defence minister and oversees internal security matters as the head of the Council of Political and Security Affairs. Mohammed bin Salman has launched a number of ambitious projects since his father ascended to the throne in 2015, including attempting to overhaul the oil-dependent economy and pursuing a more hawkish foreign policy at a time when younger Saudis started feeling the pinch of fiscal austerity. He also said he would lead the country back to “moderate Islam,” and the kingdom recently announced that it would allow women to drive in June 2018. Most notably, Mohammed bin Salman has been pushing forward with his ambitious Vision 2030 reform plan, which aims to curtail what he called the kingdom’s “addiction” to oil via various measures, including the public listing of a part of the kingdom’s crown jewel, Saudi Aramco. Since Mohammed bin Salman has taken an increasingly important role in both domestic and foreign policy, most analysts aren’t expecting any major policy shifts in the near future following the events over the weekend. “Saudi Arabia’s latest anti-corruption purge further consolidates Crown Prince Mohammed bin Salman’s power, which will in turn be positive for the reform drive beyond short-term market instability,” analysts at BMI Research said, arguing that his anti-corruption drive will likely be well-received by the Saudi population and by investors. “That said, the continued clampdown on dissenting voices raises long-term risks of backlash against King Salman and the crown prince, especially if the reform momentum stalls or if Saudi Arabia’s assertive foreign policy backfires,” they added.